Welcome to Muffin Tin Monday. The weekly blog link up here at Muffin Tin Mom where this community of moms and caregivers share the muffin tin meal they've made for their kids that week. Muffin Tin Mom is the official home of the Muffin Tin Meal. It's hard to believe that we have been doing this for over 2 years now and chances are, if you've seen MTM mentioned elsewhere in the online it's because of this little-blog-carnival-that-could and you, dear readers who I have loved connecting with, each and every step of the way. To read more about MTM origins, be sure to check out the FAQ page. To celebrate, I wanted to share with you one of my most favorite reader submitted Muffin Tin Meals. It's from The Masked Mommy and after being seen here was featured on other notable blogs such as The Crafty Crow. This week I will be highlighting some more of my favorite themed muffin tin meal reader submissions. We are also gearing up for themes beginning August 23rd. Don't forget that you will be able to find out what the current week's theme (or no theme) is by checking the top of my blog's side bar (If you are receiving this by feeburner or email, you'll have to click through. Themes are on a "two on, one off" basis. Now, It's your turn. What did you make for Muffin Tin Monday? Won't you share it with us? Be sure to click on the blue "add your link" button and enter the url of your mtm blog post or online photo. What wonderful lunch! I love all the holes. That hungry caterpillar tin is the cutest thing ever! We are looking forward to the upcoming themes! Happy MTM! wouldn't it be funny if you put a fake caterpillar in one of the holes? yes. i have a sick sense of humor. These are so cool! Adding to my bookmarks, as I am definitely going to have to try this. How cute! 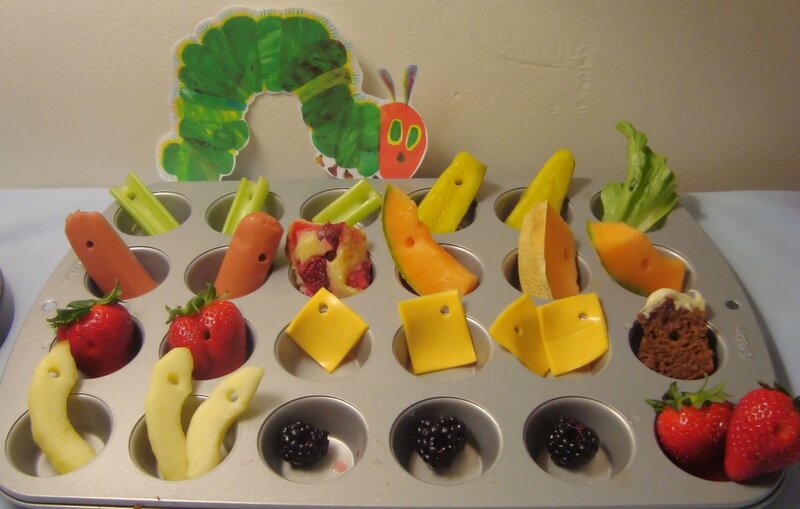 I was totally thinking this week of how to do a hungry Caterpillar bento since that's all the girls have been reading lately. LOVE this tin! Oh, the hungry caterpillar! What a great idea! One of these days...I'll get it together and link up! LOVE the Hungry Caterpillar one! Thanks for highlighting it! It's not letting me link up. I'm sure it's on my end! :P But here is my link anyways! for next week! So bummed! love all the muffin tins this week!